I was born and brought up a long way from Plymouth in Kettering, Northamptonshire. Although my love for the little market town remains, this in part this was one of my many reasons for choosing the coastal city in which to continue my learning. The stark difference in locality made Plymouth both a very nice place to live and indeed the perfect place to study Geography. The accessibility to a vast range of landscapes certainly makes for a fun and exciting couple of years away from home; both learning and discovering your independence! My passion for Geography goes way back to primary school, and is predominantly centred around being outdoors and going on field trips! I can remember always being intrigued by the world and asking questions - where things are, why they are there, what changes them, and so on. Not only that, the opportunity for developing a whole range transferable skills and actually being able to apply these to the working environment was, for me, a big factor in choosing Geography. What exactly did you study for your degree? Whilst at Plymouth I completed a BSc in Geography with 1 year Professional Practise; for which I gained a 2:1. I completed modules in the likes of Tectonic Geomorphology, Cold Environments, Ecological Sustainability; and visited places on fieldtrips such as Bath, Ireland and Iceland. As the course progressed I was introduced to Geographical Information Systems (GIS), which I then specialised in by completing a placement year to develop my skills in this area further. I was particularly interested in the GIS element of the course because it naturally brought together my love for both technology and Geography. This eventually led to my final year dissertation, focussing on the use of GIS in Schools at Key Stage 4, for which I was awarded a first class mark. There are many highlights that I can think of that take me right back to being in Plymouth and working towards my degree. 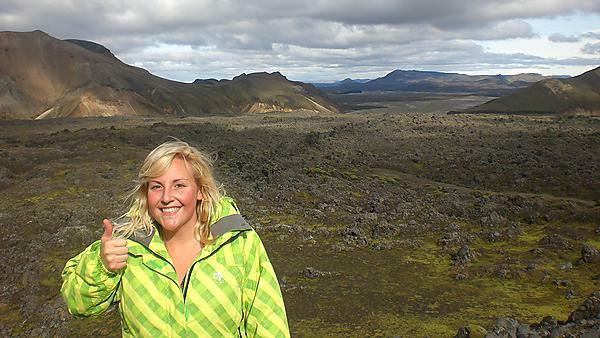 The chance to go to Iceland with its vast landscapes are nothing like I have seen before and indeed since! My work placement year not only allowed me to practise my GIS skills, but it also saw me undertake a research trip to Malaysia. This was a fantastic opportunity to again, see a unique part of the world with a great group of people. Finally, the learning environment that I experienced at Plymouth is second to none, in regard to both the physical environment, and the class environment. Easy access to Dartmoor, Plymouth Hoe and the South West coast allowed for many an adventure; and the relationships that I and each of my fellow students were able to build with the lecturers and lab teams made the whole experience both enjoyable and valuable. On graduating from Plymouth, I opted for the ‘gap year’, and completed a 3 month trip across America, starting in Los Angeles and finishing in New York. Not quite ready to give up the education, I then completed an MSc in Geographical Information Systems (GIS) at the University of Leicester. This gave me the opportunity to draw upon the basic skills that I had learned at Plymouth and hone them for the ‘real world of work’. I am now working as a Geographical Information Systems Specialist for global management, engineering and development consultancy, Mott MacDonald Limited. My current role is GIS Lead for Land Referencing on the High Speed Two (HS2) project for the Country North area (Staffordshire and Warwickshire). At a glance, this involves leading a small team through the management of large amounts of spatial data, the design and production of various land maps; and the maintenance and development of an online mapping system. Undoubtedly, working on the largest engineering project in Europe at present has been fast paced, highly demanding and at times, very stressful… but that is also what makes it so enjoyable! How has your geography degree helped you to get (and do) the job you do now and how useful has it been in your career so far? Without having been introduced to GIS as part of my Geography degree at Plymouth, I would probably still be completely unaware as to what it is and what it can do. GIS aside, the additional transferable skills that I was able to develop during my time at Plymouth have been equally as significant. The most useful of these skills would be time management, spatial awareness, professionalism and communication. No matter what your career path, these four skills serve as a solid foundation and it is the Plymouth Geography team that I have to thank for them. Also, the placement year allowed me to not only put into practise the skills picked up in the first couple of years, but also recognise what was need to improve on in the final year before going out into the big wide world of real employment. Did you expect or plan to be doing what you are doing now? Any plans for the future? Whilst completing my degree, I always expected to be working under the Geography umbrella after I had finished. I didn’t plan to be working for a particular company, or indeed working in a particular sector, but that is what I love about the subject. You don’t necessarily know where you’re going to end up, but you’re likely to learn a lot and enjoy the journey in getting there. In the distant future, I expect that I will eventually train to teach Geography and GIS, in the hope that I can inspire others as I have been inspired myself. I would unquestionably recommend studying Geography for a degree on the basis that the broad range of skills that you will acquire and develop could literally take you anywhere. Studying Geography initiates and develops expertise that to the most part can be utilised cross-sector. There is always the opportunity to specialise in a particular area of interest, and you’ll have a brilliant time doing it, make lots of lifelong friends, and what’s more, it’s fascinating!